Suchitra Sen, the enigma, the star, the ethereal beauty, the style icon, an actress par excellence. A tribute to the ‘Mahanayika’. This evergreen number from Suchitra Sen’s classic film Mamta aptly captures the enduring magic of this legendary actress… such flowers keep spreading their fragrance even when they have dropped off the stem. Her cult classic Bengali films continue to enjoy repeat runs on Bengali TV channels. Four of her seven Hindi films are considered milestones (she is one actress who had the shortest of forays in the national mainstream and yet left an indelible mark). 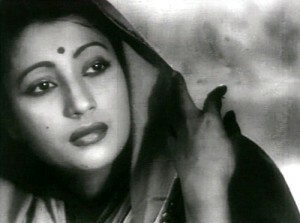 Suchitra Sen lives… in the hearts of thousands of cine fans. Yet, despite being Bengal’s greatest star, referred to as “Mahanayika” (the star of stars), Suchitra Sen had consciously chosen to step into oblivion at a time when she was still enjoying lead roles and she remained an enigma till her last. 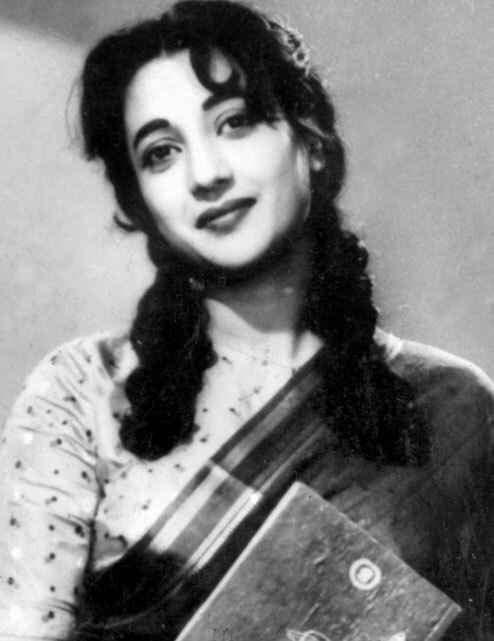 Suchitra Sen, the enigma, the star, the ethereal beauty, the style icon, an actress par excellence, has been the undisputed Queen of Hearts for Bengali cine fans across generations. Born in 1931 in Pabna, Bangladesh, Suchitra Sen stepped into the world of movies in 1951, four years after her marriage to Dibanath Sen. In many ways, Uttam and Suchitra represented what young lovers sought from their love lives, but could not attain. Her pairing with Bengal’s King of Hearts Uttam Kumar created classic romantic hits (Agnipariksha, Harano Sur, Saptapadi, Pathey Holo Deri, Kamal Lata, Indrani, Sabar Upore, Suryatoran, Shaare Chuattor, Sadanander Mela, Jiban Trishna, Ekti Raat, Chaawa Paawa, Shapmochan, Bipasha, Priyo Bandhobi, Grihaprabesh, Naborag, Trijama, Rajlakshmi Srikanto, Har Mana Har, Alo Amar Alo, Ora Thakey Odhare, Sagarika, and others) that have enjoyed ageless popularity and are watched, loved and admired even to this day. The sky rocketing popularity of this romantic pair created a benchmark that remains unchallenged to this day. 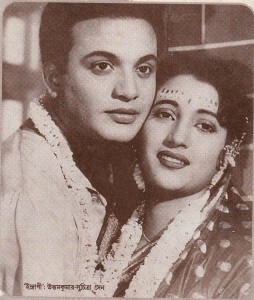 No other romantic pair in Bengali cinema in the subsequent decades have been able to match up to the magic created by Suchitra Sen and Uttam Kumar. 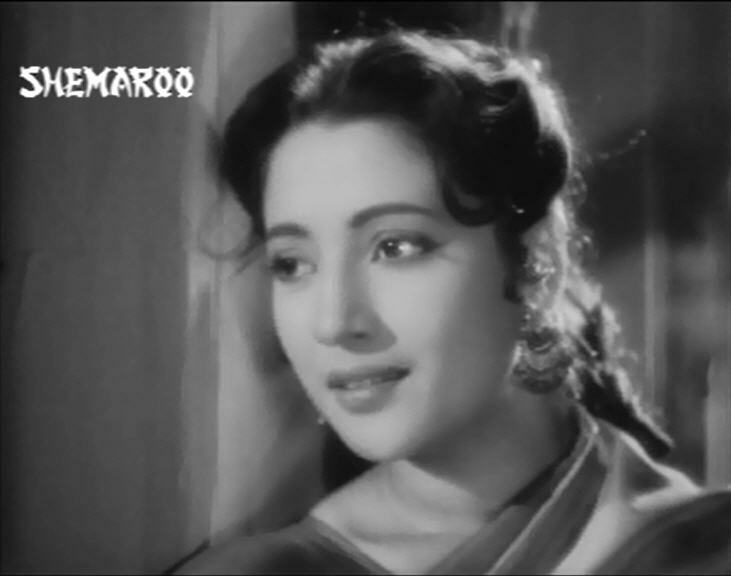 A classical Indian beauty with incredibly photogenic face, redoubtable screen persona, an enchanting pearly white smile, impressive dignity and amazing acting talents, Suchitra Sen was a unique combination of looks and abilities that helped leading film directors weave stories that featured her as the central character, a notable departure in an industry that has traditionally banked on male dominated storylines. 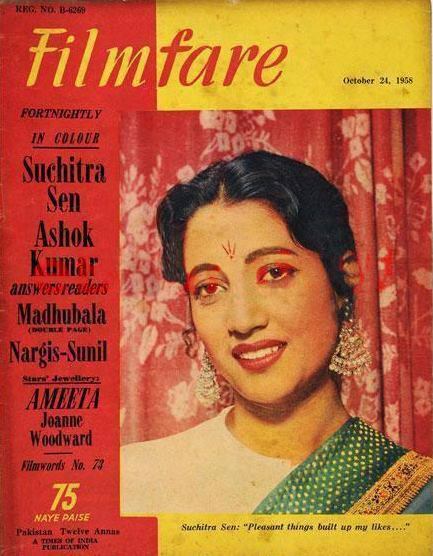 Later in her career, when Suchitra Sen made a conscious effort to do films that were different from the romantic hits, to establish herself as an actress in her own right, she came up with award winning performances in roles that exploited her histrionic skills in all possible challenges. Saat Paake Bandha, Uttor Phalguni (later remade in Hindi as Mamta), Dweep Jele Jai, Dutta… each a classic on celluloid. She was the second Indian actress to be awarded in an international film festival (Best Actress award for Saat Paake Bandha in the 1963 Moscow film festival). Gulzar’s Aandhi, Asit Sen’s Mamta and Bimal Roy’s Devdas are three unforgettable Hindi films Suchitra Sen did in her illustrious career (out of a total tally of just 7 Hindi films). 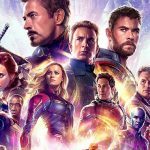 Each of these three films was a path-breaker for its storyline, acting performances and direction. We have loved her films, admired her awe-inspiring charisma and wondered how she has been able to wow cine buffs across generations till today. It does not matter to those who love her cinema that her films were in black and white, mostly shot within the studio… What we keep watching over and over again is those bottom angle shots that captured her ethereal beauty in part-light-part-darkness, those tear-welled eyes that wouldn’t shed their tears but made the viewers cry and that amazing spontaneity of performance. 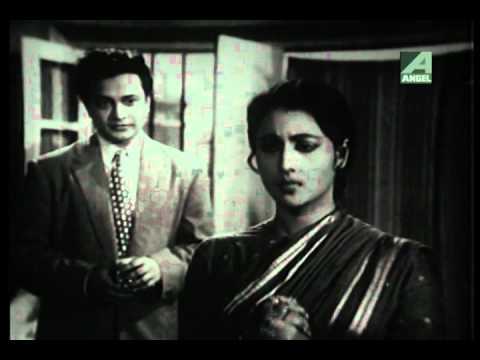 When my colleague (a Punjabi of the today generation) asked me for some DVDs of the romantic hits of Suchitra Sen and Uttam Kumar it surprised me to see that a person who has had no exposure to classic Bengali films would want to watch old black-and-white films in a language she does not understand. When I inquired, she said the cover photograph of the book Uttam Kumar Suchitra Sen – Bengali Cinema’s First Couple had fascinated her and that she wanted to see what this famous “chemistry” was all about. That made me realize the impact and ageless magic of this iconic pair – it refuses to fade away although cinema has moved miles ahead, in terms of technique, tools and thematic content. With just 60 films (with Bengali and Hindi put together), Suchitra Sen’s repertoire is much lesser than her contemporaries or even her most famous co-star Uttam Kumar (who is said to have done over 200 films). However, despite the very limited body of work, she set milestones in cinematic proficiency and incredible star popularity that other actresses have found hard to match. “Be it her carriage, demeanour, attitude towards life, or even her sudden retirement and withdrawal from public life, Suchitra remains a mystery… A look at Suchitra’s life and films reveals an intelligent woman intensely aware of her capabilities and charisma, and who went to great length to retain her mystique,” writes Maitreyee in her book Uttam Kumar And Suchitra Sen: Bengali Cinemas First Couple. What makes Suchitra Sen’s films retain their aura and appeal is the actress’ ability to choose films that were strong in story content, where her role and character was clearly etched and she practically occupied equivalent screen space with her male co-star. It could be a hilarious romantic comedy such as Chaowa Paawa (a adaptation of Frank Capra’s iconic It Happened One Night) or Ekti Raat or a story with a tragic end such as Shilpi – her role was as important and as critical as the hero’s. Not content with playing just the romantic interest, Suchitra ensured her character on the screen had a definite purpose and a space of its own. Think about Roma in Harano Sur and her quiet struggle to revive the memories of Alok who is suffering from amnesia, or the fiery temper of the Anglo-Indian girl Reena Brown in Saptapadi; the fiercely self respecting Shakuntala of Jiban Trishna; the courageous and passionate Paro of Devdas; the proud activist of Suryatoran (where she played a role modelled on Dominique, the female lead in Ayn Rand’s bestseller The Fountainhead), the ambitious and dignified Aarti of Aandhi – each role is etched in the viewer’s memory for her understated performance and uncanny ability to emote through her eyes and expressions, using dialogues only where necessary. Her acting prowess and her impressive ability to carry a film to success squarely on her shoulders prompted leading filmmakers of the era to write scripts that had her as the central character. Asit Sen’s Dweep Jele Jai had her playing the golden-hearted nurse Radha who loses her own sanity in her bid to cure her patient (the film was later remade in Hindi as Khamoshi with Waheeda Rehman playing Radha). 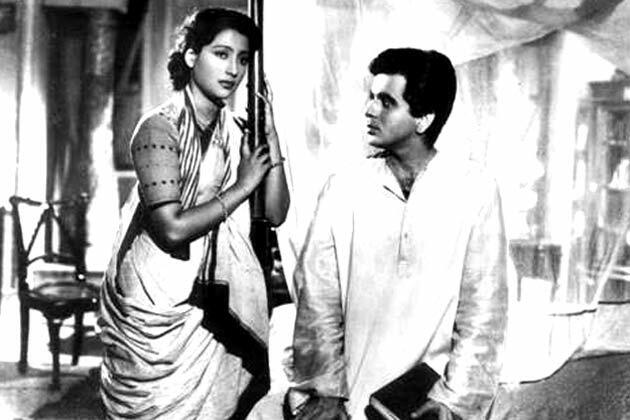 To do justice to Sarat Chandra Chatterjee‘s novels that are famous for their strong and bold female characters, Suchitra Sen was the first choice – be it the quiet dignity of Achala in Grihadaha or the bold confidence of Bijoya in Dutta and Paro in Devdas or the title roles of Kamallata in Kamal Lata or Rajlakshmi in Rajlakshmi Srikanto – her personality and magnetic screen presence gave an added dimension to these powerful literary characters. 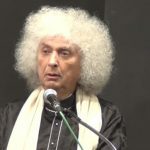 Gouri Chatterjee, in Open the magazine, adds, “It was Dibanath who spoke to producers and studio heads for an opening for his wife, accompanied her to meetings with directors and screen tests. He has even been seen, in the early days, lolling against his Morris Minor outside a studio while his wife was busy inside. And, when things turned sour, the marriage faltered, Suchitra neither divorced nor publicly disowned her wayward husband. He died in America in 1969, away from his family. In her first brief stint with Bollywood, she did two films with Dev Anand, Bambai Ka Babu and Sarhad, Hrishikesh Mukherjee‘s National Award Winning film Musafir and Bimal Roy’s classic Devdas, apart from a film with Bharat Bhushan named Champakali. She did not look back at Bombay again till Asit Sen cast her in Mamta, the Hindi remake of his Bengali hit Uttor Phalguni. In both the Bengali and Hindi versions (Uttor Phalguni and Mamta), Suchitra Sen had a challenging double role – as the mother who thrown into the life of nautch girl chooses to stay away from her daughter to ensure for her a safe, educated upbringing. Dutta (based on Sarat Chandra Chattopadhyay’s novel), Sandhya Dwiper Shikha, Naborag, Priyo Bandhobi, Devi Choudhurani, Smriti Tuku Thaak… in all these films her role was a cut above the usual heroine roles in Indian films, her role was the focal point of the film. Suchitra Sen commanded tremendous respect from not only her fans, but also her co-actors, directors, technicians and journalists. She is known to have been a very private person who kept her personal and professional life strictly apart. And yet her behaviour and interaction with her co-workers, co-actors and support staff was always dignified, respectful and humble. 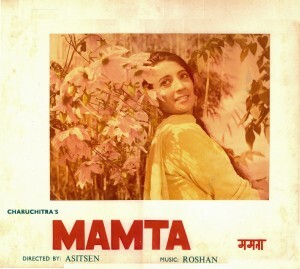 Music of extraordinary rich quality was an inseparable part of Suchitra Sen’s career in both Bengali and Hindi films. In Bengal, her voice was primarily Sandhya Mukherjee and the duo delivered unforgettable songs that are considered cult classics. Listen to one of their earliest hits ‘Gaane mor kon indradhanu’ from Agnipariksha and you can’t help marveling at the harkat of the ‘kuhu-hu-hu-u-u-u’ that Sandhya Mukherjee achieves in this amazing number, a rare feat for any singer. Picturised on a misty cliff with the budding star couple Uttam and Suchitra, this song and the film firmly cemented the duo as Bengali cinema’s most loved romantic pair. The Sandhya-Suchitra duo went on to create some unforgettable screen melodies – the romanticism of Ghum ghum chaand (Sabar Upore), the pathos of Amar jibane nei alo (Suryatoran), the lovable Tumi na hoy rohitey kachhe (Pathey Holo Deri), the shy Ami swapne tomai dekhechhi (Bipasha), the heart-touching Ke tumi amare daako (Agnipariksha) and many more. At a time when Sandhya Mukherjee’s voice was synonymous with Suchitra Sen, Hemanta Mukherjee and Nachiketa Ghosh picked Geeta Dutt. 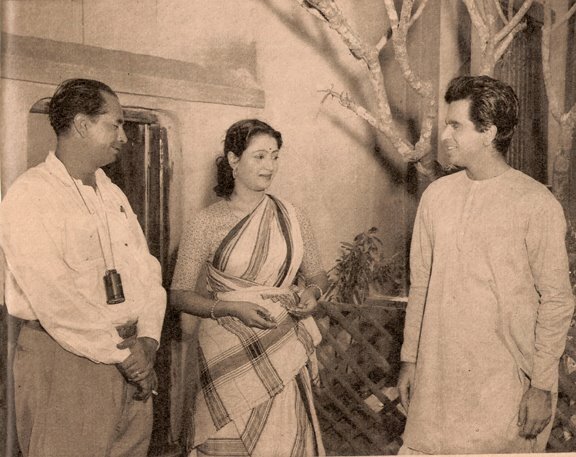 With music directors Hemanta Mukherjee (better known as Hemant Kumar in Bombay film industry) (Harano Sur) and Nachiketa Ghosh (Indrani, 1958), the Suchitra Sen-Geeta Dutt combination came up with songs that were hauntingly melodious, youthful and heartwarming. Not surprisingly, among Suchitra Sen’s best known melodies are those sung by Geeta Dutt as the film directors went the extra length to picturise these songs where the beauty and histrionics of Suchitra Sen fully justified Geeta Dutt’s dulcet voice and vice-versa. 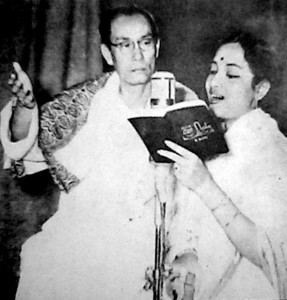 Some of the most popular Bengali songs of Geeta Dutt are picturised on Suchitra Sen – Tumi je amar (in Harano Sur), Eyi sundoro swarnali sandhyaye (in Hospital), Jhonok jhonok konok kaankon baaje and Ogo sundoro along with the duet with Hemanta Neer chhoto khoti neyi (all three in Indrani). 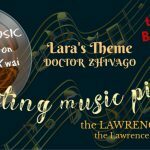 Needless to say, these songs are among the most famous songs for the actress as well. In Hindi films again, Suchitra Sen’s brief repertoire is studded with some evergreen songs. Bambai Ka Babu and Devdas had S D Burman spinning his melodious magic. In Devdas, it is the music that creates a touching backdrop to a remarkable scene when Mohd Rafi’s voice slowly fades in Kaheen ghani chhaon hai, lifting through the palki-bearers’ sing-song Manzil ki chaah mein, and Paro and Chandramukhi cross paths, not knowing each other. 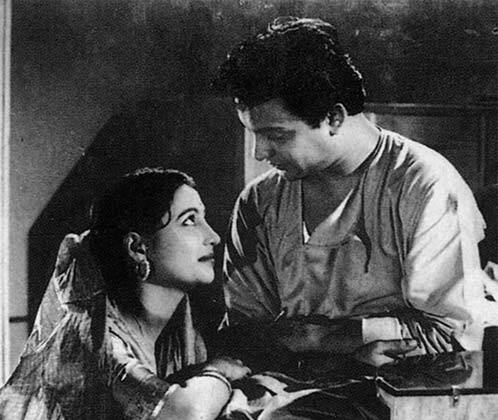 Writes Maithili Rao in ‘Idealized Women and a Realist’s Eye’ in the book ‘The Man Who Spoke in Pictures Bimal Roy’, “The long-deferred moment of ironic epiphany, when the departing Paro, framed in her palanquin, and Chandramukhi, trudging along the muddy path, gaze wordlessly at each other – two women who are chained by their love for one man and never destined to meet – is a brilliant departure from the novel.” Paro (Suchitra Sen’s) expressive eyes gazing at Chandramukhi (Vyjayanthimala) trying to recognize her through a telepathic emotional connect makes a matchless frame, which not surprisingly is among Suchitra Sen’s most popular photographs available on the web. The songs of Bambai Ka Babu explored the full range of moods from melancholy to carefree abandon. And the songs picturised on Suchitra Sen (Dekhne mein bhola hai dil ka salona and Deewana mastana hua dil) topped the charts due to their undercurrent of verve and joy. Deewana mastana hua dil is perhaps the first song in Hindi films with a beautiful echo effect, when there were hardly any electronics to create any such an effect. Suchitra Sen’s brief stint with Hindi cinema created two more masterpieces – Mamta and Aandhi, both remembered to this day for their eternal melodies as well as for awe-inspiring performances. Rahe na rahe hum (Mamta) and Tere bina zindagi se koi shikwa toh nahin (Aandhi) – both featuring Suchitra were handpicked by the legendary singer Lata Mangeshkar in her list of 20 most favourite songs. In fact, after Suchitra Sen passed away, legendary singer Lata Mangeshkar admitted that she is a great fan of the enigmatic actress, in an interview to Hindustan Times, “Suchitra Sen was one of the finest actors I have ever seen. When she did Hindi films, she would come to Mumbai. She did Bimal Roy’s Devdas (1955), in which she starred opposite Dilip Kumar. She was amazing. I have seen Devdas at least 10-15 times,” she said in the interview. “I told her that I don’t know Bengali, but she asked me to say, “Khub bhalo (very good)”. I told her I knew the meaning of this phrase. I never met her again,” she told Hindustan Times. Lata Mangeshkar-Suchitra Sen combination created some eternal beauties in the music scene. If you want a perfect example of expressing one’s innermost emotions without the help of words, watch Suchitra Sen and Sanjeev Kumar in this classic from Aandhi, sung with heart and soul by Kishore Kumar and Lata Mangeshkar. Suchitra Sen, 82, bid adieu to this world early on January 17, 2014, following a massive heart attack with a multi-organ failure, after battling a critical lung infection for 26 days. “The demise of Suchitra Sen is the demise of a beautiful era of Bengali cinema. In a way I’m glad that she could retain the evergreen image that the public have in their minds for her. To me she will always be the one and only Diva of Bengali cinema, there has been no one like her and perhaps will never be anyone like her. 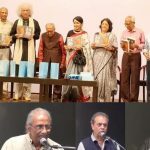 Its a sad day,” Maitreyee B Chowdhury, author of the book Uttam Kumar And Suchitra Sen: Bengali Cinemas First Couple told Learning and Creativity, the day the diva passed away. What a treat on this legend. She was grace personified. No matter if it was a light hearted role, or a serious emotional scene. 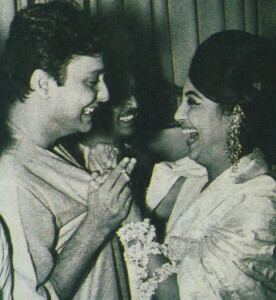 I don’t think she ever cared who her co-star, but she loved working with Uttam Kumar the most. Your appreciation makes a huge difference. Suchitra Sen’s pairing with Uttam Kumar made film history… such chemistry between an on-screen couple has not been replicated. There have been popular on-screen pairs but none can match the enduring magic these two created to enchant and keep the audiences glued to the screen or TV when their films are played. It is a pity they did not work together in Hindi films. Uttam Kumar’s early stint in Hindi films was not successful. Suchitra Sen made very brief forays but each time she came and saw and conquered and then… well, quietly withdrew leaving her fans wanting more. Thanks a lot again for visiting and sharing your views on my favourite actor! Delighted! Delighted! So much value in this essay! So much that I am going to take away! Fabulous, Antara! About Seema, I think I need to add a clarification here. This Seema is not the Nutan starrer. It starred Simi Garewal and Kabir Bedi – remember that song “jab bhi yeh dil udaas hota hai”. It was supposed to be made in 1969 by Sohanlal Kanwar but was finally made in 1971 by Surendra Mohan. Awesome essay, Antara.. So beautifully curated, the vastness of the elegant lady and her devotion and dedication to her art. I can never forget the backward glance she gives to Dev, even as she walking away for her doli. Her other scenes in the songs, “Dekhne mein bhola hai”, and her pursuing Dev at a comfortable distance, trying to decipher what he was all about in “sathi na koi manzil”. 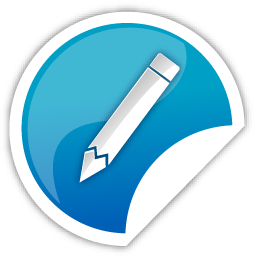 Keep up your good work, research and writing.. you have a blessed pen. 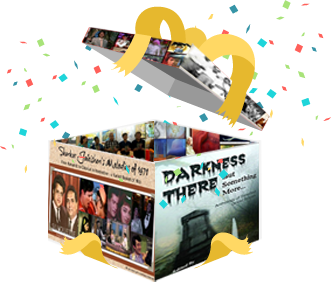 Thank you so very much Sneh Di! Such a beautiful appreciation – makes all the work worthwhile. Yes, Suchitra Sen does not cease to amaze me – her eyes did all the speaking. Lovely voice and diction too she had (I am speaking of Bengali films)… in Hindi too she managed not too badly, although the accent gave her away at time. But overall, the end result that came on screen was not only because of the director but even her own acute sense of camera angles etc. Before giving the shot, she would inquire about the lens size and then decide which angle would suit her close up best. But without ever imposing herself on the director. Amazing lady. But they don’t make anymore like her.